We have the best friends ever. 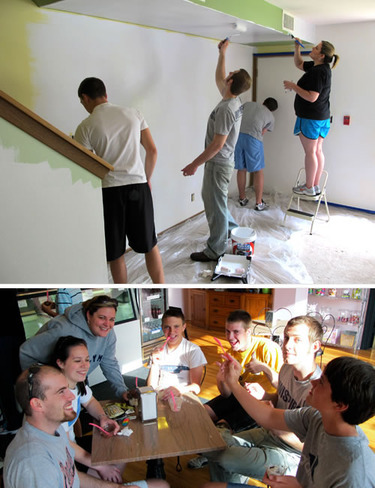 On May 22nd, Jess, Nick, Alec, Zak, Katie & Aaron helped us paint our old apartment back to white before we moved out. It was such a fun day! Well, it was quite exhausting, actually, but the company made it very fun. We jammed out to music, cracked jokes, splattered paint, and ate yummy food (thanks Katie!) while we worked at covering our green & yellow walls. What a fun group! Afterwards, we took them all out for ice cream as a thank you. The whole thing was a little surreal... we painted right away when we moved in there 3 years ago. To see it mostly empty with white walls was just weird. It really made it "click" a little more for us - yep, we were actually moving out. We spent almost 6 hours painting as a group on Saturday, then Chad and I added a last coat on everything the next day (about 7 hours). Monday evening was spent cleaning up all of the paint from the carpet & trim...and sinks and counters and floors. :) How did that paint get everywhere?? Price you pay for fun...although our fingers were raw from scraping paint & scrubbing, it was still WELL worth it. What awesome helpers we had....that would have taken the two of us forever on our own. Another post-midnight return to the new place. Tuesday & Wednesday evenings were claimed by adult small group and our last Merge of the school year (awww.....), so our final cleaning waited until Thursday evening. Man. Home stretch...it was another long one of vacuuming, sweeping, scrubbing, scraping and washing, but the reward of a gourmet dinner cooked by our new friend, Dimitri, was giving us an added boost of motivation. Cream of mushroom soup, orzo pasta salad with roasted pine nuts and baked tilapia. Mmmmmmm. Nicely done, Dimitri!